I feel a pretty strong sense of loss at this point in the game. In that I don't know what to do. He has a lot of pieces blocking his area, and I'm kind of moving around randomly. 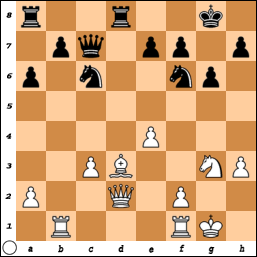 My reason for playing here is to move out of the way so that I can move my pawn at F3 forward next. 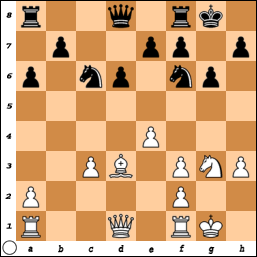 Then my queen can move along the white diagonal area. Whether that's desirable or not... I don't know. If he takes E4-D5, I retake with my F knight, threatening to take his now undefended C3 pawn (the knight he just moved was defending it). If he pushes C3 to C4 to threaten my knight, my options are to retreat it to safety or hop it over to F4, which is a bit of a weakness thanks to the double pawns. There, I threaten his isolated H pawn (which if I take with my knight, will be check) and generally make myself a nuisance. If he pushes C3 to C4 directly, double attacking my pawn, I take D5-C4 and then he cannot retake with the bishop without allowing me to capture his queen with mine. Of course, he'll recapture my queen with a rook, which I can then contest with my own rook on the same file, offering further trades , which are advantageous for me as I have still retained a material advantage. The queen exchange, although theoretically profitable for black, leaves white always contesting the open file in gote. He can swap off all the major pieces, but then he is going into an endgame with N vs B. That may not be enough to offset the extra pawn, especially if white plays A4, making it hard to advance the extra pawn. After the bishop retake, I'd push B5, then follow with Q to A5 or B6. The short term goal would be to post the night at C4, possibly compelling white to trade the bishop back for it. 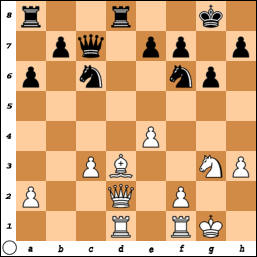 The long term goal would be a winning endgame with an outside 2-1 pawn majority, or a passed pawn on the C-file. Black's advantage should still be more than enough to win, but of course there is a lot of variance in the result at this level. Black should absolutely not capture a pawn on c4, though, which would fix one of White's major weaknesses (the isolated c-pawn) for him. ...Black should absolutely not capture a pawn on c4, though, which would fix one of White's major weaknesses (the isolated c-pawn) for him. 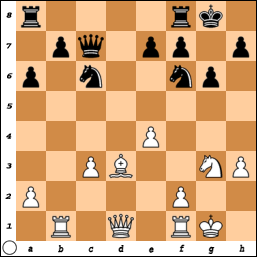 The C4 pawn, although isolated - and therefore a weakness - can be used to highlight one of black's weaknesses: the backwards B pawn on a semi-open file. 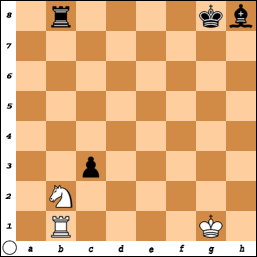 White would love to trade his C pawn for black's B pawn. If the C pawn gets too far advanced, black may have to do that. Either that, or black remains stuck with a backwards pawn. 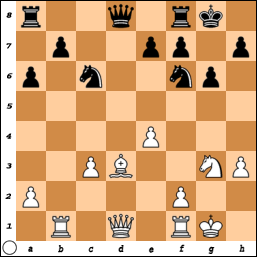 The sequence that I suggested, although removing white's weakness, also removes black's weakness also. And it leaves black with a clear 2-1 pawn majority on the queen side. My first thought is to take his pawn. But then he can take my pawn with his knight, which puts my other pawn at risk. Since I can't think of a good move locally, I decide to threaten his own pawn with my rook. I don't see much reason not to take here. I'm threatening his bishop, so he doesn't have time to take my unguarded B pawn with his rook. After he retakes my pawn, then I think I'll decide how to guard the B pawn. ... After he retakes my pawn, then I think I'll decide how to guard the B pawn. Guarding the pawn is counter productive. 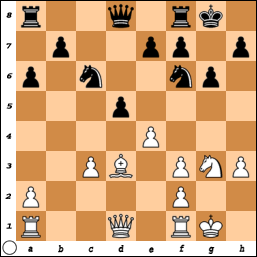 If white gets an opportunity to play A4, then black has a permanent weakness: a backwards pawn on a semi-open file. Black will have to guard that pawn for a long time. The best way to handle the situation is to make it non-backwards. Black should play B5. Boy, it's been so long I definitely lost whatever calculating I had done to prefer this or moving my A rook to B8. I'm currently teaching a course that I have never taught before, so I am exhausted and sleep deprived. Rather than think this through super carefully, I'm going to keep the game moving. What I like about this move: it protects my b7 pawn, it connects my rooks so they can support each other, and it helps defend e5 from a pawn advance in tandem with my c file knight. The downsides are that my queen is doing a lot at once and is not herself defenses. In particular, if I use my c file knight to take on e5 if he advances the pawn, I will have to be wary not to miss any attacks on my queen that would be possible after moving the knight. At the moment, there is a white pawn on the C file, so a revealed attack along that file is impossible unless he gets a rook or a queen out in front of it (or it gets taken). 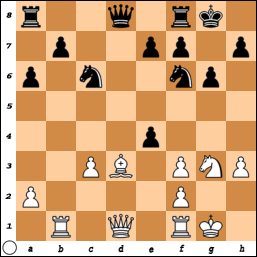 Centralizing the knight, blocking the pawn, and attacking the bishop. General plan is to go for an advantageous endgame. Edit: Oops! Wrong player to play. Last edited by Bill Spight on Thu Jul 19, 2018 8:39 pm, edited 1 time in total. I'm assuming that Kirby's queen is headed for e3. He must have seen the pin coming, so he couldn't have been seriously planning to leave it at d2. Then, the natural question arises: why not use e2 as the intermediate square? The only answer that I can find to that is that Kirby intends to reposition his knight by bringing it back to e2. Did you see the pin coming? If so, why did you keep your queen on the e-file? And did you consider Q-b3 instead? Not really sure what you mean. What is a pin? The knight is pinned: if it moves, loses the rook. I didn't see any sort of pin coming. My strategy was just that I wanted to threaten going to h6. I suppose it doesn't have much meaning.